Secretary General Ban Ki-Moon (UN SDG report 2016). Accordingly, the (then) Ghana government, officially launched the SDGs in Ghana in 15th Feb 2016 by demonstrating Ghana’s commitment to enable public understanding of and support for the SDGs in the country. 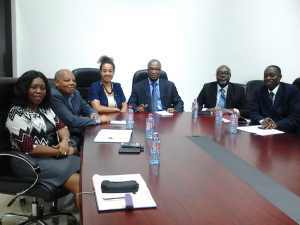 First Dr W Anim Odame Executive Secretary Lands Commission and Surv J Ofori Boadu, Deputy Executive Secretary invited Vice President Diane Dumashie to the Ghana Lands Commission head office located at Cantonments, Accra. A fruitful meeting was held and included the Directors of Survey & Mapping, Valuation and Land Registration, enabling a discourse and exchange of views around the challenges facing the wider land professionals to maintain societal relevance in line with the SDG’s and specifically building the capacity across the African continent. Concluding with the Lands Commissions commitment that their staff will be encouraged to continue to engage with the FIG wider membership. 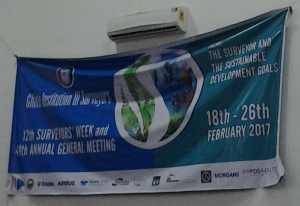 Next, GhIS (a FIG Member Association) held its 12th annual Surveyors week (and 48th annual general meeting) “The surveyor and the sustainable development goals” starting on February 18 and concluded on February 26. The surveyors week is a terrific weeklong event, bringing together the land professionals, across 4 divisions (Survey and Mapping, Valuation, QS and Estates Surveys), inviting sister organisations and engagement with key stakeholders from governments, civil society, academia, the development community, and the private sector. 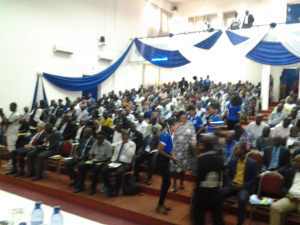 The main venue, at the Ghana Institute of Management and Public Administration, was beneficial to a busy week that opened on Day 1 with a press conference launch, Day 2 outreach to civic society with an afternoon of public education, TV and radio stations interviews and a further afternoon of public dialogue and crucially Day 3 the orientation for new GHIS members. 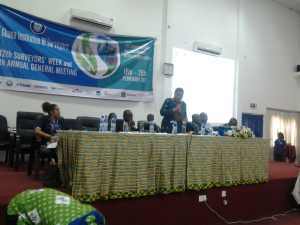 The thematic deliberations on Day 4 were chaired by Hon Madame Atta Akyea, Min for Water Resources, Works & Housing and included an opening presentation from Mr Sulemana Mahama Technical Director, Ministry of Land and Natural Resources. 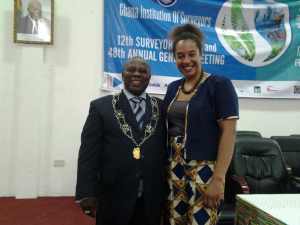 Goodwill messages were delivered by Vice President of FIG, President of NIS and AFRES Africa Young surveyor’s chapter President. 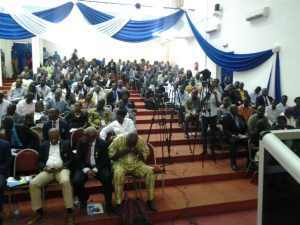 The key note address was provided y Prof Ebenezer Owusu Oduro Vice Chancellor University of Ghana. Three key notes were delivered and all signaled the importance of societal benefit in land governance and land professionals actions, including the technical aspects from ‘Ghana’s Enterprise Land Information Systems’, D Hoskins, ‘Gender Equality in Land’, Dr Akosua Darkwah, and ‘The Role of the Surveyor in the SDG’s ‘, by Dr Diane Dumashie. This was followed by interactive and parallel breaks out sessions across the range of land professional activities. Traditionally, the final day involves the Presidential lecture, delivered by President, Emmanuel Martey FGhIS. He outlined that National governments have the primary responsibility for the implementation of the SDGs and must take the lead by establishing national plans. This effort was already visible in the development of the shared growth and Development Agenda II (40 yrs development plan- the Ghana we want’, as part of the global process for defining ‘the world we want’) by the National Development Planning Commission. The NDPC is the lead national public sector institutions for integrating the SDGs in national development plans, as well as regional development agendas such as Agenda 2063 of the African Union. The lecture is followed by the Annual General Meeting, at which the incoming President, Surv Edwin Addoh-Tawaiah (FghIS), was sworn in. The busy week is concluded with the highlight Presidential Ball. 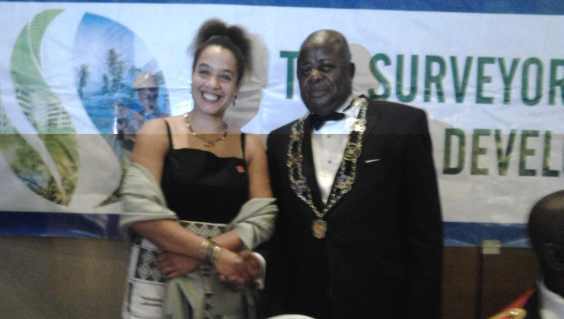 Joined by the guest of honour Member of Parliament France Manu-Adabor, all delegates enjoyed a ceremonious and lively evening, including recognising and congratulating those GhIS members elevated to the Class of Fellow. Finally, the conference theme focus on the SDG’s is timely and important to the FIG Africa Regional Network (ARN) activities, given its 4 year term mandate to undertake annual workshops that are underpinned by the SDG’s. Vice President Diane Dumashie chaired the ARN steering group. The members conducted the oversight matters associated with the running of the network, and agreed the final ARN strategic framework document that will be formerly delivered at the next Roundtable scheduled at the FIG 2017 Working Week in Helsinki, Finland www.fig.net/fig2017 .